Courtesy of Alta Sea, Port of Los Angeles, California. 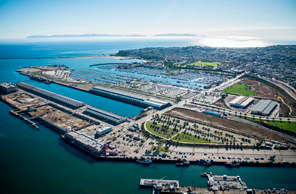 On January 27th between 10 am - 12 noon relatively near the finish point of Catalina Channel crossings, an open house at Alta Sea (located at Berth 58 in San Pedro) will feature information on three current projects at the ocean innovation campus. 1. Southern California Coastal Ocean Observing System brings together coastal observations in Southern California to provide information necessary to address issues surrounding climate change, ecosystem preservation and management, coastal water quality, maritime operations, coastal hazards and national security. 2. The Junk Raft, built by Marcus Eriksen, is on display at AltaSea. The Junk Raft out of plastic water bottles and broken sailboat masts to help others understand the dangers of plastic pollution. He sailed the ship 2,600 miles from Los Angeles to Hawaii. The adventure of building a raft out of trash and then sailing it across the Pacific Ocean will be described. 3. An update on the expected start of The Longest Swim and the challenges it will face will be provided by Benoît Lecomte and his crew that will be onboard his solo stage swim from Tokyo to San Francisco. Attendance at this open house is free and open to the public. For more information, visit here. RSVP to rsvp@altasea.org by January 22nd to confirm attendance. Contact Robin Aube at raube@altasea.org with any questions.